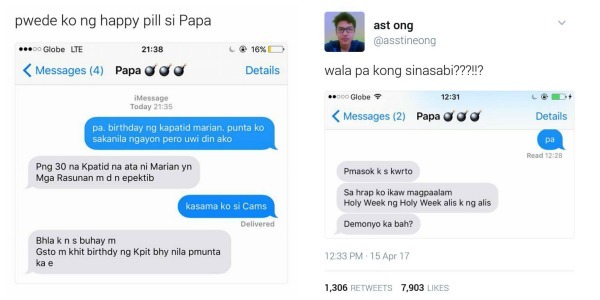 MANILA, Philippines - A father’s snappy comebacks to his son’s text messages has won the Internet. A certain Ast Ong’s hilarious conversation with his father, which he posted on Twitter, has recently went viral after it was posted by a certain Remz Tolentino on his Facebook page. The post has amassed over 26,000 reactions and more than 21,000 shares as of this writing. Ong, who was apparently staying with his father this Holy Week, has received grumpy text messages from him for no apparent reason. At one point, Ong asked his sleeping father to open a bottle of Coke for him. Irked by his son’s seemingly trivial request, his father sent him an unforgiving text message. Like many young people, Ong would use birthday parties as excuse to hang out with his friends. However, his father knew this strategy very well and didn’t seem to buy his alibi. Check out if Ong’s line looks a bit familiar. In one of his messages, Ong simply wrote “Pa”. His father knew what exactly was in Ong’s mind. Before he could even open up about the topic and ask for his permission, his father pretty much indirectly answered it with a resounding “no”. He even called him a “demon” for wanting to go out during Holy Week. As expected, many netizens found their exchange of text messages hilarious. Some of them were even reminded of their own fathers and in some cases, mothers. Earlier this year, a Filipina mom became an overnight sensation on social media because of her funny random anecdotes on Facebook. Estrelita Santos Calacala, a 58-year-old mom from San Miguel, Bulacan, now has over 190,000 followers on her Facebook page.